The pungent effluent from the nearby farm, discourages loitering near Brims castle. This is unfortunate, for its decaying fabric is well worth a second glance. Details hidden from earlier observers can now be seen and a better understanding of its construction is possible. Designed primarily for defence, a number of modifications over its long life, turned it into a comfortable and spacious dwelling. There can be little doubt that this castle was built in response to the aggressive policies pursued by George, 5th Earl of Caithness, against neighbouring landowners. His appointment as Justiciary of the North of Scotland, in 1556, made him the final legal arbiter of all crimes, except treason, in Caithness and Sutherland. Under the guise of ‘keeping the peace’ he used this authority to bully and harass his neighbours. 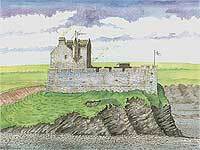 In 1569 after a dispute which ended in the Oliphants being beseiged in Old Wick castle for eight days; Lord Oliphant petitioned the Privy Council ‘That it is not possible for him to get justice in a court presided over by Caithness, and wants the case tried before an impartial tribunal”. The same Earl confined his own son and heir in Girnigoe castle under conditions which led to his death after seven years. He was indeed a very dangerous and ruthless opponent. Brims castle is located where there are few natural defences. It is close to the best landing place on the estate which suggests that it was originally conceived as a fortified store house from which grain rents could be sent to market. Coarse clay was used to bind the stones of the rectangular keep. At ground level the vaulted store could be entered only through a trapdoor in the floor of the hail above or via an extremely narrow mural stair in the south east corner. The main entrance to the keep was on the first floor in the north east corner of the hall. This hail with its large fireplace in the west gable probably served as a kitchen in the original design. It was also the level from which the castle’s defence was undertaken. Where the harling has weathered away it is now possible to recognise five wide mouthed gun ports; one in the north wall, two in the west gable and two in the south wall. A third port in the south wall may have been removed when the large west window was installed. Further gunports probably lie hidden under the plaster of the east gable. Each port is made of two pieces of John O’Groat sandstone with a horizontal joint line and in the wall above each position are two strong lintels, indicating that the gun loops are original features and not later inserts. When under attack, the first floor of this small keep must have bristled with firearms. It is quite evident that these red sandstone openings had been exposed to the weather for many years before being deliberately blocked and covered with plaster. The wooden second floor was supported on four stone corbels protruding from each of the longitudinal walls. A fireplace in the east gable has red sandstone surrounds of superior quality. This may however be a later feature, contemporary with the large windows in the south wall. Ledges, formed by reducing the wall thickness, are the main indication of a third floor. The Ordnance Survey Name Book, suggests that this was once a full storey which had been reduced in height. However the crowstep gables appear to be relatively unaltered and it is probably best to interpret this as an attic. The space was certainly occupied, for there is a fire-back inside the west gable, and the absence of a chimney may indicate that this fire had a hanging lum. The original doorway between the stair tower and the attic was modified when the small turret was added to the east wall of the castle. The turret sits securely on thick walls where the stair tower abuts the north wall of the keep (and not as shown in MacGibbon and Ross). Within this turret there would have been a stair to a, now missing, caphouse above the main stair tower. The entry in the O.S. Name Book probably refers to the removal of this caphouse and not to a complete floor of the castle. It is now clear that the stair tower, which gives the castle its typical L-plan, is an addition to the keep. An almost continuous joint line is evident where the stair wall meets the north wall of the keep, and on the second floor it can be seen that the stair wall overlies the original mouldings of the keep doorway. Like the keep, the entrance to the stair tower was at first floor level. The present entrance is in the east wall but an earlier blocked doorway is now apparent in the west wall, in the conventional re-entrant angle. This doorway was blocked when a lean-to kitchen was constructed outside. The raggle of the kitchen roof cuts diagonally across the blocking. External access to this early doorway was by a wooden walkway, as indicated by a line of filled-in beam holes which can be seen along the north wall of the keep. A newel stair climbed within the tower from the first floor to the third and even though the upper steps have collapsed, it is evident that the stair never ascended beyond the third floor. On the central column of the stair is incised a mason’s mark. Several small windows illuminated the stair, some have been blocked and others enlarged. At ground level the hollow base of the stair tower can now be examined through a doorway, which appears to be original, in the east wall. This rectangular cell has heavily corbelled upper corners which support the floor slabs on which the newel staircase rests. The absence of support under the central column of the stair indicates that the masons considered each step to be an individual cantilever, anchored in the outer wall. No gunports are visible in the stair tower. A courtyard, to the north of the keep, was enclosed by a substantial wall. Traces of earlier buildings are embedded in the outside of the west wall of the courtyard and in the south wall of what later became the kitchen chimney. These details are difficult to interpret as they are intermixed with remnants of more recent buildings shown in the estate map of 1769. The courtyard extended beyond the gables of the keep, presumably to allow them to be defended by enfilading fire from the courtyard wall. A free standing arched gateway in the west wall appears to be a later insert. On the inside of the courtyard wall, to the south of this archway, are traces of flagstone steps which presumably led to a high level walkway. In the north-east corner of the courtyard is a small privy whose layout has been altered since first drawn for MacGibbon and Ross. The builder of the keep was probably Henry Sinclair of Broubster and Brims, who died c.1610. His father William Sinclair, the second of Dunbeath, had a charter from the Bishop of Orkney dated 1562-1564 for Dounreay, Broubster and other lands. From his designation Henry must have acquire Brims after Broubster. It follows that Brims castle could not have been built before 1564. Timothy Pont marked Brims with a castle symbol on his map of Caithness, drafted sometime between 1583 and 1596. On the same map the neighbouring castle at Dounreay has a non-descript symbol as if it was still under construction. This confirms architectural details which show Brims to be the older castle. Now Dounreay was built by Henry’s father William Sinclair, who was besieged there by the Earl of Caithness in 1590, It follows that, Dounreay castle was erected between 1583 and 1590 and the construction of Brims castle, although earlier, must lie between 1564 and 1590. When Henry died, childless, about 1610, his brother Richard fell heir to Brims. Richard was probably responsible for increasing the height of the stair tower and adding the little stair turret to the east wall. This turret is very similar to those on old Keiss castle, dated to the late 16th early 17th century. By this time George, 6th Earl of Caithness, had inherited not only his grandfather’s estate but also his policies which he implemented with such vigour that he became known as “Wicked Earl George”. No doubt his raiding parties could be spotted more easily from the higher tower. Richard’s son Alexander (Footnote 1) stepped briefly into the historical limelight when he joined the Marquis of Montrose at Thurso in April 1650. In company with Mackay of Dirlot and Mackay of Scourie, he was sent by Montrose to Tongue to recruit among the royalist Mackays. This party with their recruits rejoined Montrose near Lairg just before his last battle at Carbisdale. After the rout, Alexander was one of the party which escaped with Montrose. They eventually went their separate ways, Montrose to be captured at Ardvreck, Alexander to take refuge with his relatives at Ribigill in Strathnaver where he and his descendants continued to live under the protection of Lord Reay. In 1660 Alexander’s heir, John, sold Brims to John Sinclair of Tannach. Tannach an astute man, had soldiered on the Continent and represented Caithness in Parliament in 1652. His marriage to Ann Goldman the daughter of a Dundee merchant probably brought considerable wealth to the family. It was about this time (1665) that the Earl of Caithness installed an ornate archway to the courtyard at Thurso East and this fashion can also be seen at Brims where the moulded archway has a recess above it awaiting a coat of arms. Tannach’s son John had the good fortune to have his cousin’s estates entail to him and for a time he was known as ‘of Brims and Ulbster’. In due course his eldest son, yet another John Sinclair, inherited the Ulbster lands while his second son Patrick took over Brims. Patrick Sinclair of Brims had an affair with his cousin the daughter of James Sinclair of Uttersquoy, a holding at Holburn Head. When she disappeared in mysterious circumstances it was alleged that he had murdered her and hidden the body in Brims castle. Her ghost known as the White Lady has been reported on more than one occasion. Lord Byron, a school-friend of George Sinclair of Ulbster, is said to have used Patrick Sinclair as the model for his fictional Manfred. In 1726, Patrick sold Brims to Alexander, 9th Earl of Caithness, and it is said that he then left Caithness to enlist in the guards, however his name appears in the Register of Sasines several times between 1720 and 1735, The new owner was the same Earl who had just (Feb 1726) been driven from his house at Murkle by pirate Gow’s cannon. He may have purchased Brims as an interim measure while his new castle at Haimer was under construction. From this new residence, he took the style Lord Hemer. On his death in 1764 the title of Earl passed to the Sinclairs of Rattar but his own property including Brims was entailed on distant relatives the Sinclairs of Stevenson, who later became Baronets of Murkle. The final improvements were aimed at making the castle more comfortable to live in. First, the insertion of three large windows in the south wall and probably the new fireplace on the second floor. In plainer style, an external kitchen was constructed along the north wall of the keep. This addition partially blocked the entrance to the castle and a new doorway had to be opened in the east wall of the stair tower. MacGibbon and Ross, had assumed that this was the original entrance and suggest that it had been defended by the turret, high on the east wall, however it is now clear that when this doorway was slapped through, defence was no longer a consideration. In fact it is quite obvious that the gun loops had been blocked and forgotten about before the large windows were inserted. A two storey dwelling was built to the east of the castle about 1800 and shortly afterwards it was extended to the south. The base of the north gable of the house is exceptionally thick and is probably part of an earlier structure. Between the house and castle a link building provided an entrance hall from which a stone staircase led not only to the upper rooms of the house but also to the entrance of the older castle. Although the upper room of the extension was, from the first, connected to the rest of the house, the ground floor room had a single external door and remained isolated. This strange arrangement may indicate separate sleeping accommodation for (male) servants. The ground floor room was eventually incorporated into the house by extending the link building and opening a new doorway into the entrance hall. New doorways were also opened from the upper landing into the south bedroom of the house and into the first floor of the old keep. The first Ordnance Survey map c1872, shows a block outline of the castle, courtyard, kitchen, house and the lean-to building outside the west wall of the courtyard. It also shows a small extension to the house which preceded the modern bathroom. Prince Charlie’s wanderings after Culloden have never been fully documented and a visit to Brims is not impossible though unlikely. The owner, Lord Hemer, normally resided in his new castle at Haimer and the occupier of Brims in 1746 is not known. Shortly afterwards, in 1751, the County Valuation Roll shows three landowners responsible for Brims estate; Ulbster, My Lord Murkle (Lord Hemer), and his brother Mr Francis Sinclair. The Laird of Ulbster and Lord Hemer were strong supporters of the Government during the Jacobite uprising and would not have sheltered the fugitive. However the sympathies of Mr Francis are not on record and there are many examples in Scottish history of close relatives deliberately supporting opposite sides in an uprising so that the family estates would be safeguarded no matter which side prevailed. If the occupier had Jacobite sympathies then Brims castle would have been a safe, if daring, place of concealment, with easy and discreet access to the sea. When considering the validity of this legend, it is worth remembering that another house in Shore Street, Thurso, also boasts a ‘Prince Charlie’s bedroom’, and it seems likely that some senior Jacobite was lurking in the locality. One of the rooms in the old keep was used as a bedroom until 1920, while the rest of the house continued in occupation until the mid 1970s. Sadly, in the 1980s the roof of the castle was deliberately collapsed and at present only the vault is used as a store by salmon fishers. No doubt, as the castle deteriorates further, it will give up more of its secrets, perhaps even the remains of the White Lady. Note: A Second Glance At Brims Castle was written by George Watson for the April 1998 Edition of the Caithness Field Club Bulletin. First Statistical Account, Thurso Parish, Sir J Sinclair, 1798. Caithness Family History, J Henderson, 1884. History of Caithness. James T Calder. 1887. The Castellated and Domestic Architecture of Scotland, MacGibbon & Ross, 1887 -92. Inventory of Monuments etc in the County of Caithness, 1911. Cromwellian Scotland 1651-1660. F D Dow. 1979. Montrose, For Covenant & King. E J Cowan. 1995. Ailsa Brims has now made available a whole book written by her Grandfather. It is available free to download from the web site and is a historical document relating to that section of the Brims Family but also an interesting read in its own right.